Beer. Birra. Bier. - A blog about beer and brewing. : Sink The Bismarck! Tasted! On Friday night I tried the much talked about "Sink the Bismarck! ", a 41 per cent quadruple IPA by Scottish Brewer Brewdog. The beer was debuted by Brewdog's James Watt at London pub The Rake, and is current holder of the "Worlds strongest beer" title. See here for thoughts on the announcement and surrounding marketing of the beer. This is just a quick blog to talk about impressions and opinions, now that I've been able to actually taste it. Marketing, naming and controversy aside for a minute, this is about the beer and the concept only. The beer is a marmalade-orange colour with some haze. The nose is massive hops at first and then a big toffee malt backbone reveals itself. Mark from Pencil and Spoon described it as smelling like putting your head into a sack of the freshest hops. He's right, but there is a definite background toffeeness there too. The taste, as you'd expect, is massive. You get hops first, which build to masses of orange flavour. If you told me this had been flavoured with orange, I'd believe you, that's how pronounced it is. There's a nice amount of that toffee sweetness following through from the nose, quickly chased by punishing, brutal bitterness. The texture is thick, very thick and sticky. Cough medicine, syrup, you get the idea. Imagine taking a piece of toffee, spreading thick cut marmalade all over it and then rolling it in hops. That's what this beer tastes like. Remember when you were younger and Soda Streams were all the rage? You used to buy concentrated syrups of your favourite soft drink and then dilute them with freshly carbonated water. The end result being something close to the bottled original that you just buy in the shop. 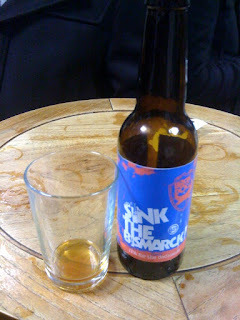 Sink the Bismarck is exactly how you'd imagine the soda stream concentrate for a double IPA to taste. I'm glad I've tried Sink! It's a cool experiment, that's unfortunately been distracted from slightly by the surrounding marketing. If you get the chance to try it, then do. If £40 is affordable for you, go for it. If you've got a group of mates that would be willing to chip in for a bottle, then get them round, open a bottle and discuss. It isn't a beer that you'll want to drink every day, but I don't think that's the point. It's cutting edge, it's something that hasn't been done before, it's thought provoking and challenging. It's an experience that I think every beer enthusiast will enjoy. Sounds like it would be nicer chilled than warm, what do you think? I think if you like your Whiskey with an ice cube, you'd probably prefer it cold. I found myself sipping water even between the few mouthfuls that I had. Avoiding the whole drinkability debate, I think cooling/ice/water could mellow it out a bit and allow it open up in the same way as with Whiskey. the islandbeer have 29,3% alc.